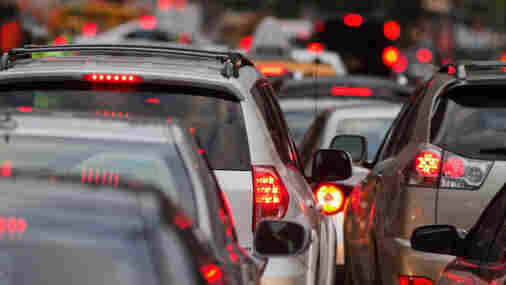 Cheap Gas Means More Driving And Getting Stuck In Traffic New federal numbers show that amid falling gas prices, Americans drove a record 3.15 trillion vehicle miles last year. This also means more pollution and traffic gridlock. Why are we driving more? One reason is cheap gas. After spiking above $4 a gallon just a few years ago, gasoline prices have plummeted. According to AAA, the national average right now is just $1.71 a gallon, and in some states, gas is below $1.50. "There's a lot of other factors that affect the overall vehicle miles traveled," says P.S. Sriraj, interim executive director of the Urban Transportation Center at the University of Illinois at Chicago. He says job growth is a factor, too. When the economy tanked, driving dropped off significantly. But it's picking up now as more people are back to work and again driving to and from their jobs. Sriraj says that many people are driving greater distances to get to their jobs and more people are also driving extreme commutes of more than 45 miles per day. "You also have to keep in mind the population is increasing, (so) the number of drivers is increasing," he says. He says freight shipments are increasing significantly, too, putting a lot more trucks on the roads. The sharp increase in vehicle miles traveled nationwide in 2015 is a good economic sign and many drivers are enjoying lower gas prices. But more driving is creating a couple of problems, including increased pollution. Although vehicles today use cleaner burning fuel and are more fuel efficient, the additional cars and trucks on the highways driving more miles emit more greenhouse gases. In addition, if more of us are driving more often, we're going to be stuck in more traffic jams, which might hurt productivity. "Commute times have been getting worse and congestion also getting worse," Sriraj says. "The total hours of delay that people spend in traffic per year has been going up." The Federal Highway Administration acknowledges traffic gridlock as a growing problem and says the increase in vehicle miles traveled underscores the need for a greater investment in the nation's infrastructure. The federal highway fund is shrinking because the 18.4 cents per gallon tax on gasoline doesn't keep pace with inflation and actually brings in less money as car become more fuel efficient. Some transportation advocates say this new record level of vehicle miles traveled could help make the case for shifting away from the gas tax — and instead tax the number of miles we drive to fund highway improvements.